Today I am doing an Outfits of the Week and will be talking about all of the outfits I wore this week! Monday I didn't have school and spent the day shopping so I am not featuring that outfit because it is nothing worth sharing. Tuesday I wore this striped tee shirt dress which I talked about in my Spring Try On Haul and it is so comfortable! I wore the dress with my Jack Rogers, my Kate Spade watch, my pearl bracelet, and my gold pearl earrings. Wednesday I wore another dress from try on post and it is beautiful. I will have a post about this dress up next week. I wore a denim jacket over it because we have to have sleeves on our tops at school. Once again I wore my Jack Rogers, my Kate Spade watch and my gold pearl earrings. Thursday I wore this Old Navy flowy top, a pair of Forever 21 jeans, and my lace up flats. For jewelry I wore my Kate Spade watch, my pearl bracelet, and diamond and pearl earrings. 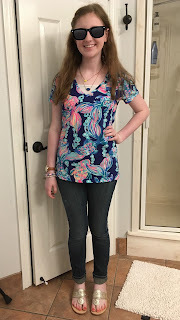 Friday I wore this Lilly Pulitzer Michelle top that I bought last weekend and i love it! 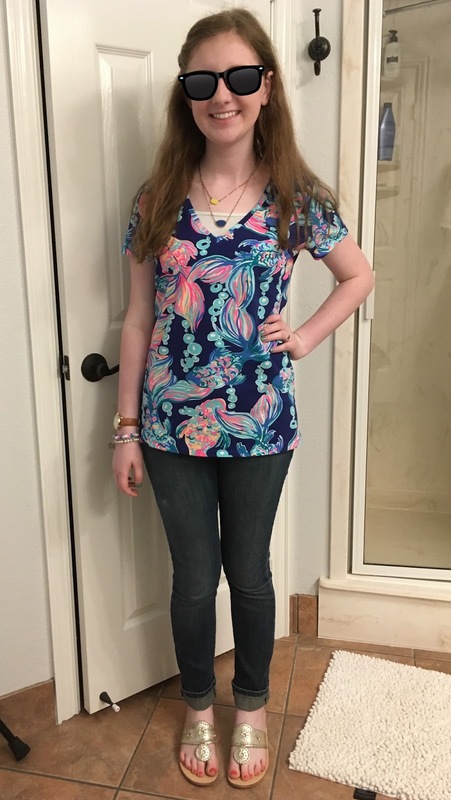 It is the first Lilly clothing item I have ever owned and I am in love! It is so comfortable and bright and I got it on sale for $29! I wore a pair of Old Navy jeans and my Jack Rogers. For jewelry I wore my James Avery charm bracelet, my pearl bracelet, my Sashka Co. pink, blue, and white bracelet, my Kate Spade watch, and my silver pearl earrings. Please excuse the bath room background and the edited sunglasses. 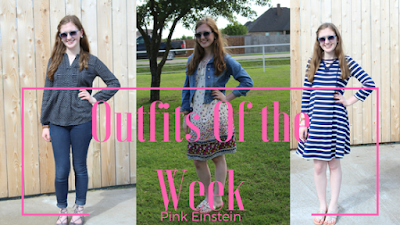 So that's what I wore this week!